Markets surged last week after a surprising June jobs report buoyed investor sentiment. The S&P 500 came within a hair of a new record close on the news. For the week, the S&P 500 grew 1.28%, the Dow gained 1.10%, the NASDAQ added 1.94%, and the MSCI EAFE fell 1.76%. Stocks surged after Friday’s better-than-expected June jobs report. The S&P 500 closed Friday at 2,129.90, less than a point from its record closing high of 2,130.82 reached in May 2015. The rally was broad-based, and we’re happy to see that investors are shaking off global worries by responding to success stories at home. After disappointing April and May jobs reports introduced worries of a labor market slowdown, the June report showed that the economy added 287,000 new jobs last month. Since expectations called for around 165,000 jobs, investors counted the report as a solid win for the economy. How many jobs does the economy need to support sustainable growth?According to a survey of Wall Street Journal economists, the break-even number for sustainable labor growth could be an average of 145,000 new jobs per month. Fewer new jobs, and the economy won’t be able to keep up with population changes as older workers retire and young adults join the workforce. As with all things economic, there are other opinions. 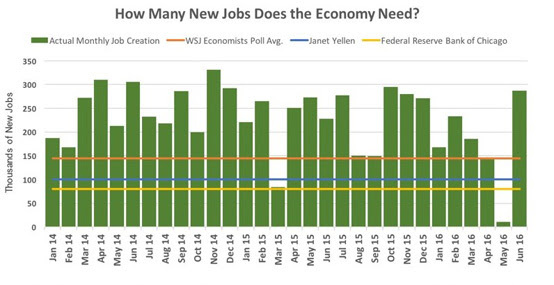 In 2013, the Federal Reserve Bank of Chicago estimated that the economy could get by with just 80,000 new jobs each month; Federal Reserve Chair Janet Yellen stated in December that under 100,000 new jobs per month are needed. You can see in the chart below that the labor market has produced above those estimates in most months since the beginning of 2014. Figure 1 Monthly Increase in Total Nonfarm Payrolls, Seasonally Adjusted Source: BLS, Federal Reserve, Wall Street Journal Digging a little deeper into the June numbers gives us more positive news. The unemployment rate rose to 4.9%, which is actually a good thing because it rose as a result of more job seekers entering the labor pool. The Federal Reserve estimates that long-run unemployment in a healthy economy should average between 4.7% and 5.0%. Even better, average hourly earnings rose 2.6% over June 2015, indicating that the labor market is tightening and employers are raising wages to compensate. Since economists had been worrying about the stagnant pace of wage growth, the June data is encouraging. After June’s strong job report, investors are feeling pretty good about the U.S. economy; however, it’s important not to let your perspective be swayed too much by a single data point. While a healthy labor market supports continued economic growth and market upside, we expect additional volatility in the weeks to come. We still face a turbulent presidential election, corporate earnings season, Britain’s EU exit, and other market headwinds. Enjoy the rally, but stay focused on your long-term goals and don’t be surprised if markets pull back again. China’s inflation drops. Last month, a measure of consumer inflation in China grew at its slowest pace since January on persistently weak demand. More government stimulus is likely to prop up the ailing economy. Weekly jobless claims fall. The number of Americans claiming new unemployment benefits fell by 16,000 last week, adding more evidence that the labor market is on solid ground after May’s miss.